IT IS hard to know why, but some folk consider puns deplore-a-bull. Others find the plays on words not only adore-a-bull, but also respect-a-bull. I am one of those devotees, delighting in efforts to add spontaneous wit and humour to our lives. So, when driving in the Rangitikei District almost midway between Wanganui and Palmerston North, I just had to stop and check out what the good folk of the small town of Bulls had to say for themselves. Above that it asks: “Herd of Bulls?” and adds the web address www.unforgetabull.co.nz. I laughed. My wife groaned. “This is going to be great,” I said. “No it isn’t,” she replied. She wasn’t being irrit-a-bull, she just doesn’t think ordinary or obvious puns are laugh-a-bull. Now on the hunt for the telltale white signs on various buildings around town I had to tip my cap to the people who came up with the idea. The signs feature the name “Bulls” on top of a graphic showing two happy bovine beasties. Underneath them is the name of the establishment. For example the one on the Bulls Medical Centre is Cure-a-Bull. The Anglican Church is Forgive-a-Bull, the Toy Library is Enjoy-a-Bull, and the Four Square store is Restock-a-Bull. Oh man, I said to myself, I am in heaven. A one-bedroom flat had on its fence “Rent-a-Bull”, the i-Site was “Inform-a-Bull”, the Plunket Society “Nonreturn-a-Bull” and the Westpac bank was, as you would surmise, Bank-a-Bull. Heck, even the coppers were getting in on it. 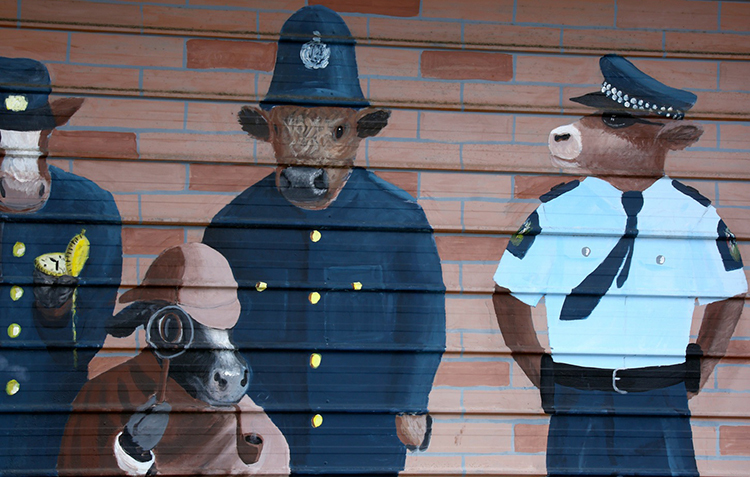 The local cop shop had Const-a-Bull sitting prominently above its door – and right next to a mural featuring bulls in police uniforms. My grin was ear to ear. My good lady had to escape and so headed across to Scully’s Products, a purveyor of fine soaps and lovely smelly things in a mid-grey villa with white trim. Teehee, I can be incorrige-a-bull! I like the way the good folk of Bulls have got into the spirit of their punny town and it gives the place a point of difference from other dots on the road map in the lower North Island. Stop, grab a bite to eat at the Mothered Goose (Delect-a-Bull), or Subway (Submerge-a-Bull), or Frankies Ice Cream Parlour (Lick-a-Bull) or maybe M&P Young Fruiterers (Veget-a-Bull). For something different have a hot beverage from Coffee on the Moove … or as you leave pick up some McDonalds at their Drive-thru-a-Bull. 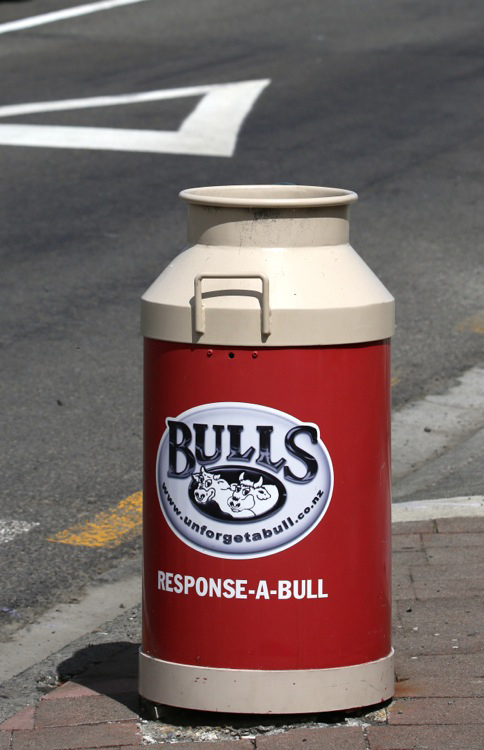 Throw your rubbish in the milk urn public rubbish bins (Response-a-Bull) and if you need a pit-stop use the Relieve-a-Bull public loos. It is well worth stopping and taking a rest break in Bulls and be thoroughly entertained by a laud-a-bull little town with an envi-a-bull marketing plan.